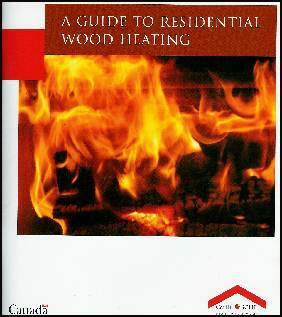 A new edition of A Guide to Residential Wood Heating is now available as a free download. The booklet is published by Canada Mortgage and Housing Corporation, an agency of the federal government. From its first publication in 1993, this booklet has been remarkably popular with the public. Cases of booklets were ordered and distributed by insurance agents, fire departments and wood heating retail stores. Several years ago it was reported that over one million had been distributed. An accurate tally of the total distributed to date is not available. Hard copies are available for purchase, either singly or in bulk, from the CMHC information centre. Call (613) 748-2367 or (800) 668-2642. Although the downloadable booklet is in pdf form and is over 80 pages in length, it is highly compressed, making it only 860 KB in size. Even rural people using dial up internet connections can download and save their copy if they are willing to wait a few minutes. For obvious reasons the booklet was written for Canadians, meaning that code references, clearances and information sources might not apply to those living outside Canada. However, anyone who heats with wood anywhere in the world will find large parts of the booklet relevant and useful. Full disclosure: John Gulland of woodheat.org led the project team that developed the 1993 edition and was involved in the preparation of this new edition.